You’ve been invited to a baby shower and you decide you’re going to sew an entire layette or possibly an entire crib bedding set for the new squishy. The you realize, dude, I’ve got four kids of my own and the shower is in a week and I’ve got no time for such ambitious gifts. You need something practical. Something handmade, useful, but quick to make. I give you the half yard baby shower gift! It’ll take you an hour to whip up and you’ll still be the talk of the party. Or maybe you’re new to sewing and want to sew something but you know you’re skills aren’t up to a smocked christening gown. So do you just buy some old something from the store? No. You sew the half yard baby shower gift! It is perfect for beginners! The half yard baby shower gift includes 2 burpies, 3 wipies, and 2 drool bibs. What is a burpie? A cuter name for a burp cloth. Great for protecting shoulders, putting under little prone to leak heads while changing diapers or sleeping, good for big baby messes. What is a wipie? 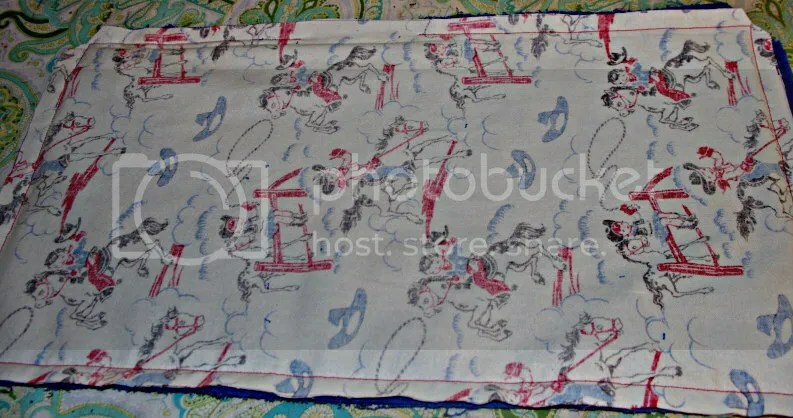 A smaller version of a burp cloth. 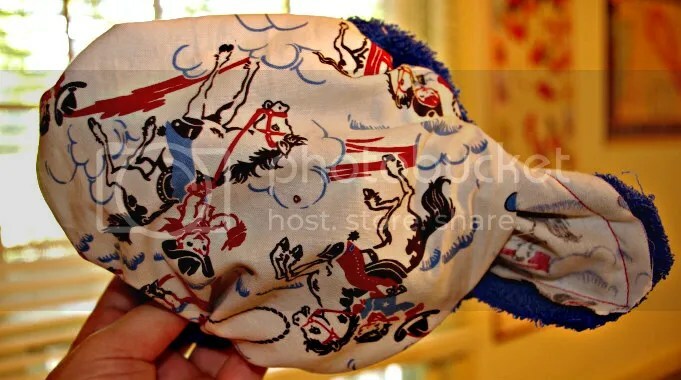 Can be used as a cloth wet wipe, washcloth, face wipe, booger cleaner, drool wiper, etc. Great for smaller baby messes. What is a bib? Seriously? Do you have a baby? Have you seen a baby? You’ll need a half yard of fabric. (You can use regular quilting cotton or flannel.) If it is going to annoy you having a directional print not quite lined up perfectly, don’t use a directional print. This project leaves no room for fussy cutting. You’ll also need one cheap (new) bath towel. You can buy the cheapies at Wal-Mart, K-Mart, or Target. (Target’s are the thickest of those three, FTR. 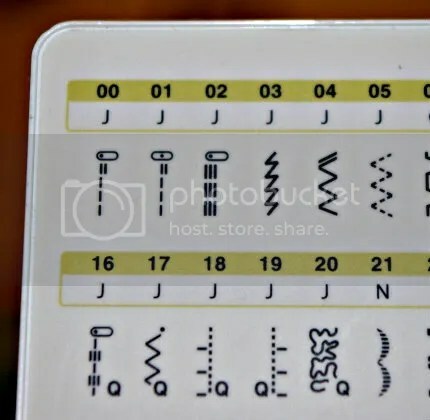 So, if you’re a newbie, it might make it more difficult to sew.) I promise one bath towel will be enough. You’ll see that I have 2 different colors of terry in these pictures. 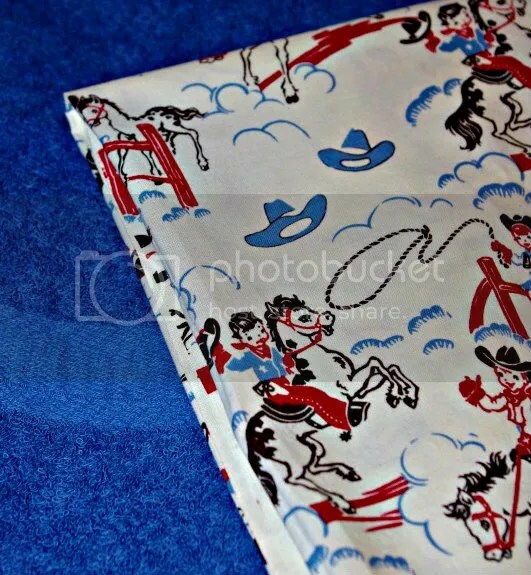 Once I got started, I realized I’d already made a couple burp cloths out of the other half of my blue towel. So, I had to grab the half of a brown towel I had from another project. All laid out, this is essentially what your half yard is going to turn into. 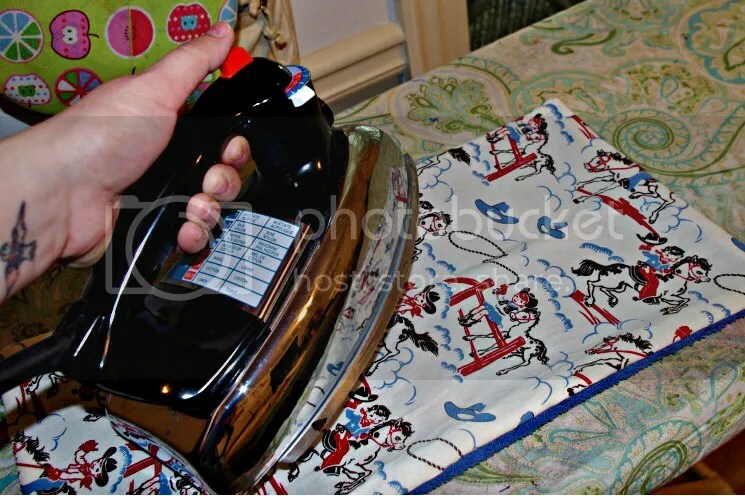 First, iron your fabric. If the ends aren’t straight, straighten them. Also, some places tend to cut a bit bigger than you request. If your fabric shop did this, go ahead and trim your fabric to 18″. Now, measure and cut 3 burpies. You’ll use the 18″ as the length and cut 10″ wide. Take one of those burpies and divide it into 3. Mark it along the length at 6″ and 12″. These are your wipies. Cut the towel to match. I cut the decorative stipe off. If your towel seems small, leave one of the stripes one, just in case you need to use it. I have used the stripe on burpies and bibs. It works fine, I just prefer not to have it. Also, the width of your towel is likely the length of one burpie plus the width of one wipie. 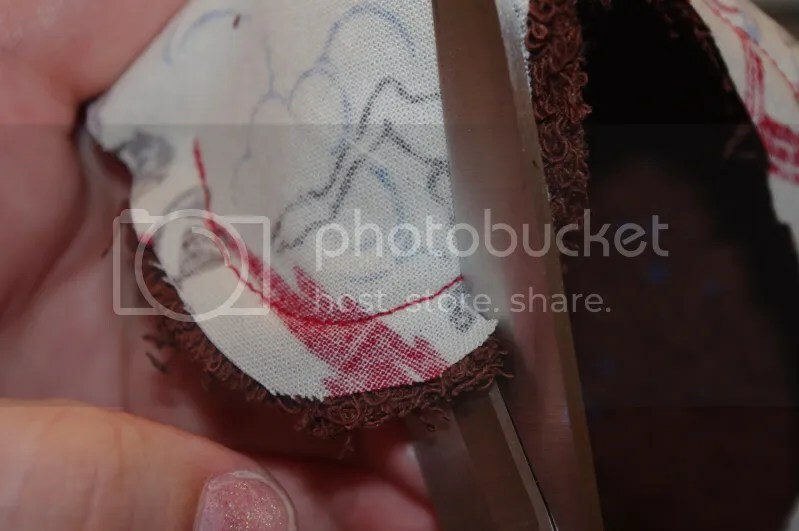 To cut the terry, I lay the cut cotton on top and use it as a template. Terry is difficult to mark and it stretches in odd ways when you pin and pull it. You should have about 14″ of fabric left. 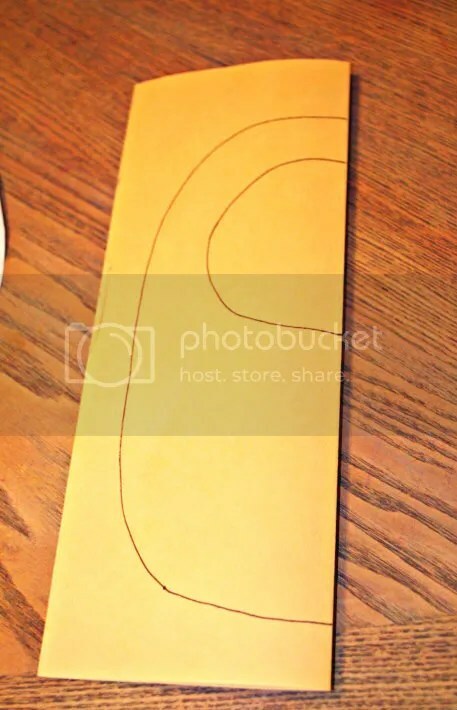 Fold this in half and lay a bib template on top. 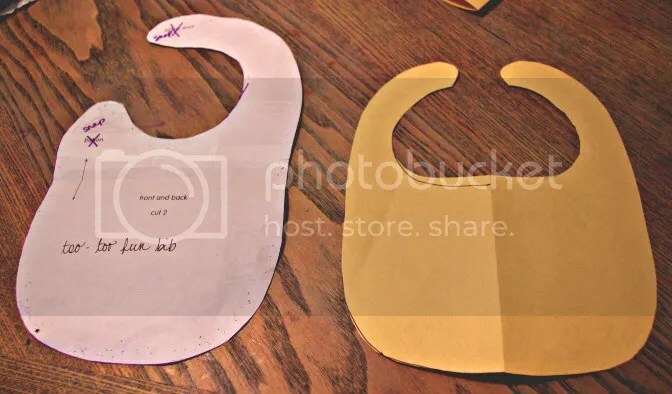 Cutting out two bibs. I had to turn mine a bit because this Michael Miller fabric wasn’t quite as wide as my Joann’s stuff I used in my first few of these. It fit fine, as you can see, I just have slightly slanted cowpokes. Cut 2 bibs from the towel. As you can see, my bib template is roughly the size of a regular 8.5″ x 11″ piece of printer paper. 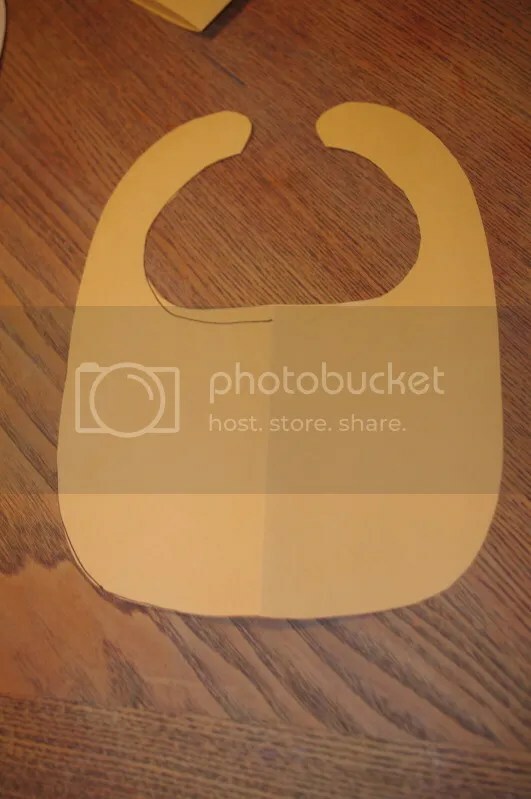 Cut out your bib shape. 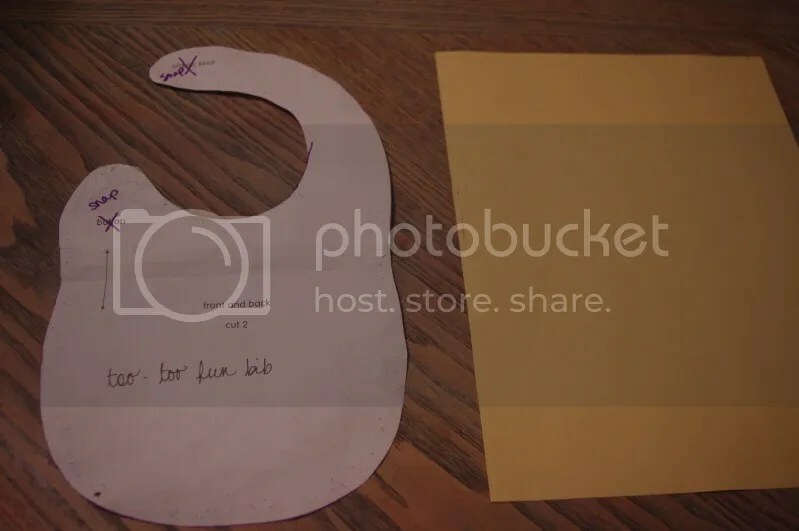 Open your bib template up and see how you like it. If you don’t like it, fix it now. 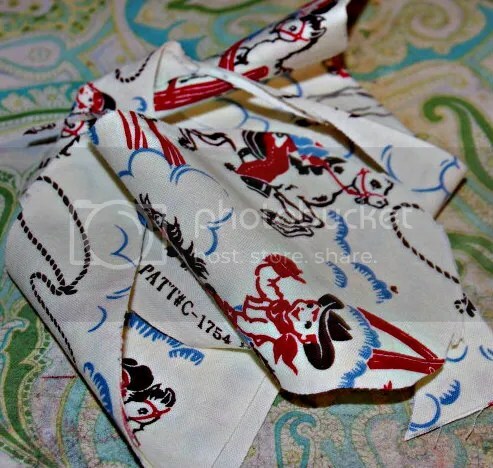 It is much easier to scrap your pattern than try to make it work in fabric. If the paper doesn’t look right, the bib certainly won’t. Do you see how my straps don’t quite touch each other? You want that. When it is snapped, it pulls down and makes a two dimensional piece of fabric into a three dimensional piece of clothing. As you can see, these two bibs would look much different from one another, but they’d both be fine. The point is to make a little bib this size. How you make the bib is up to you. Now that you’ve got it all cut out, you’ve got about this much scrap fabric. See, I told you no room for fussy cutting. 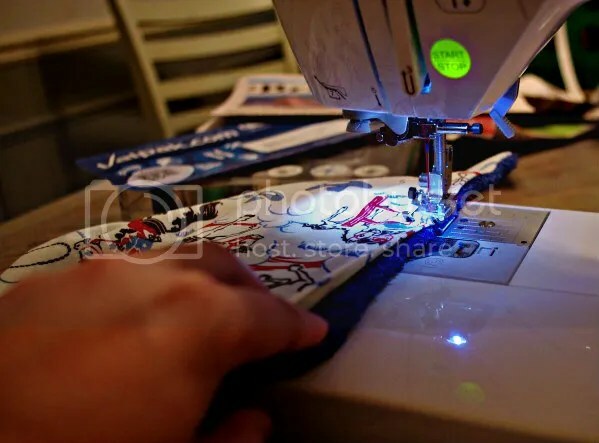 Now that you’ve got all your pieces all cut out and ready to go it is time to sew! 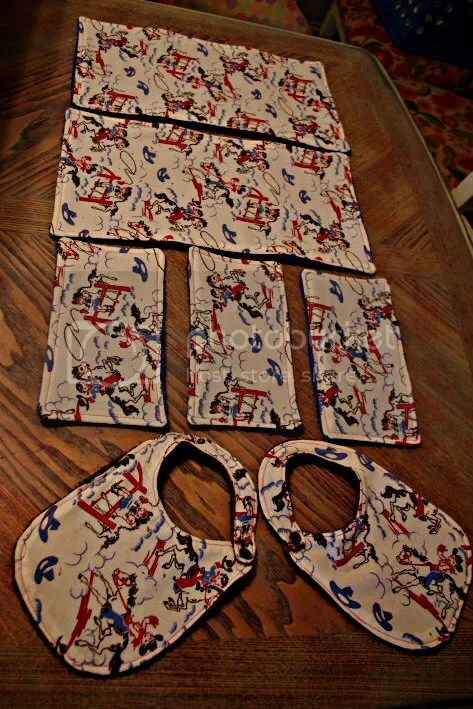 If you’re an old pro at sewing, sew, turn, and topstitch all of it, add closures of choice to the bibs. You’re done. If you are a beginning sewer, I’m going to go through all the steps for you. First, with the wrong side of the fabric down on the terry, sew around the edge of the burpie leaving a hole. See the hole? That is where we’ll turn it right side out. 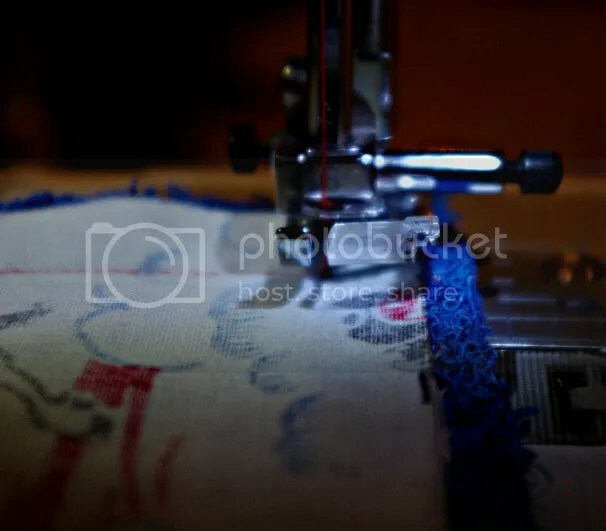 You want to reverse stitch at the beginning and the end. 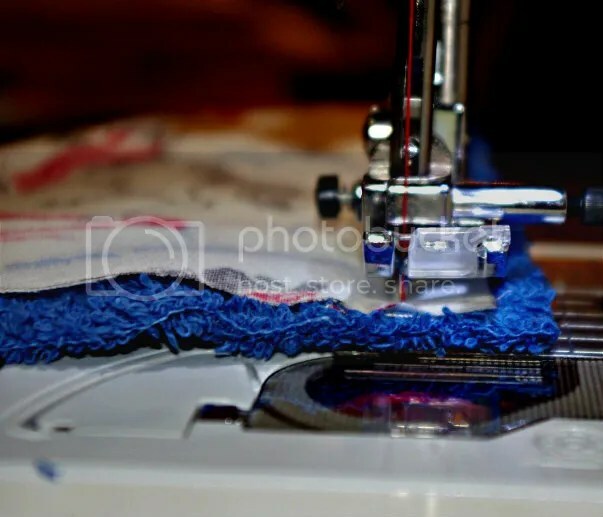 You do not want your seam unraveling as you turn. Also, if you make the hole small, life will be difficult (though not impossible) in 5 minutes. 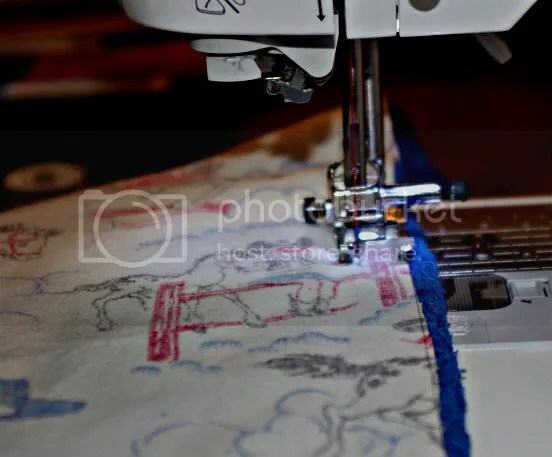 If you make a very large hole, your life might get difficult in 10 minutes when you’re having to line it up and sew it shut. You stop about where the line going the other direction will start. Eyeball it. Pick up your foot, but leave the needle down. If your machine doesn’t stop in needle down position automatically, make sure to put the needle down before you lift the foot. 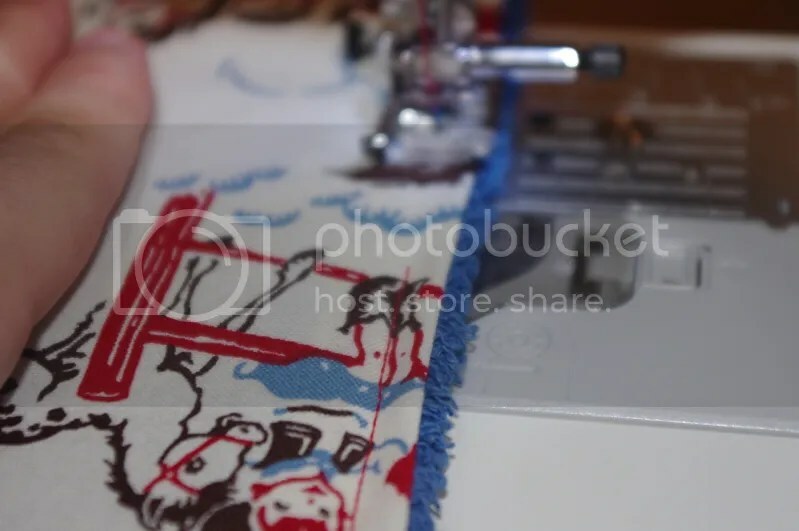 Now that you’ve sewn all the way around and turned the corners like a pro, you’ll need to clip the corners of your fabric. 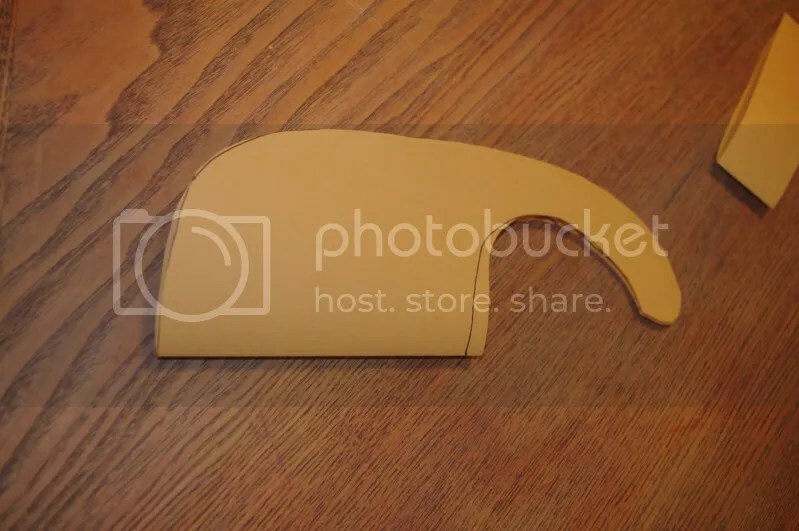 This makes it so you actually have a corner when you flip it. 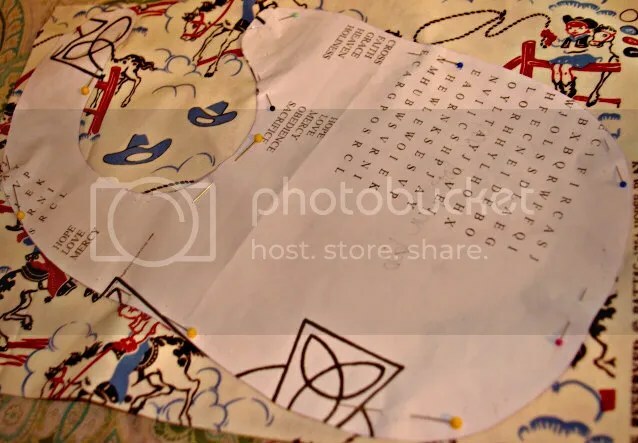 Don’t clip your corners and the fabric will bunch in the corner, making it a round more than a corner. (And it’ll be a devil and a half to sew through.) Just don’t clip your seam! Now, your burpie looks like this. And you are pretty proud of yourself for making it so nice and pretty. Good job. Now turn it right side out. Through that hole you left. Ah! I made a fabric blob! Keep turning. It’ll work out. Run your hand along the inside, pushing the seams outward. Push those corners out. Let me stop and talk about stitches before we move forward. See my #00 and my #01? The 00 aligns the needle at the far left of my foot. The 01 aligns my needle in the center of my foot. If you have this option, use it. I use the 00 to sew the inside, then the 01 to topstitch. This way, I know my topstitching is catching the right fabric. If you use the same, be very careful that the hole closes! 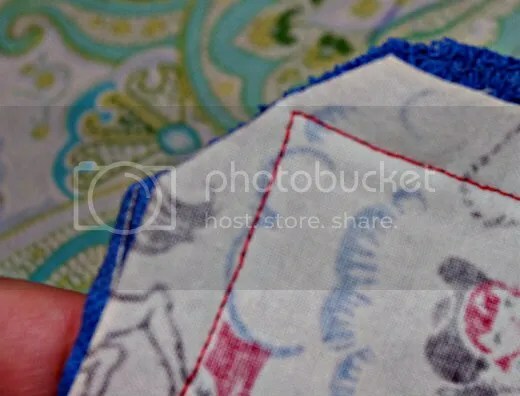 Also, I use a longer stitch length to topstitch. It just looks better to me. 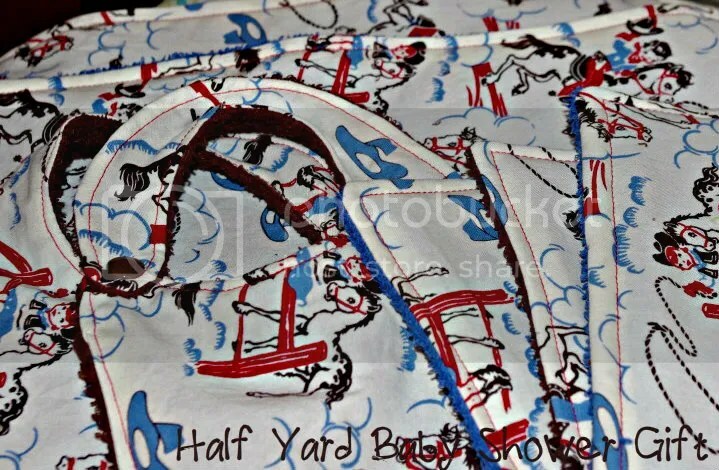 I sew with a 2.5 stitch length usually. I topstitch with a 4.0 stitch length. Turn your corners the same way you did for the other side. 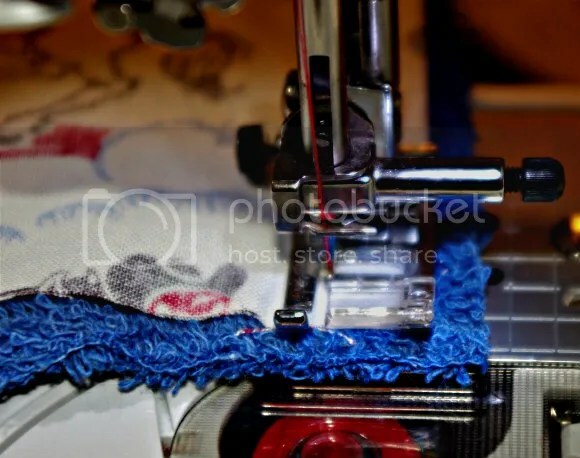 Leave the needle down, pick up the foot, turn, put down the foot, and keep sewing. Now aren’t you glad you perfected that on the side no one could see? In the corners, if your terry is particular thick or you didn’t clip quite right or if the stars just aren’t aligning for you today, you may have to push the fabric through a bit if it seems stuckish. Don’t freak about it, just push it a bit and it’ll go through and no one will notice your stitches are a bit smaller in length at the particular point because the fabric just wasn’t moving through properly. 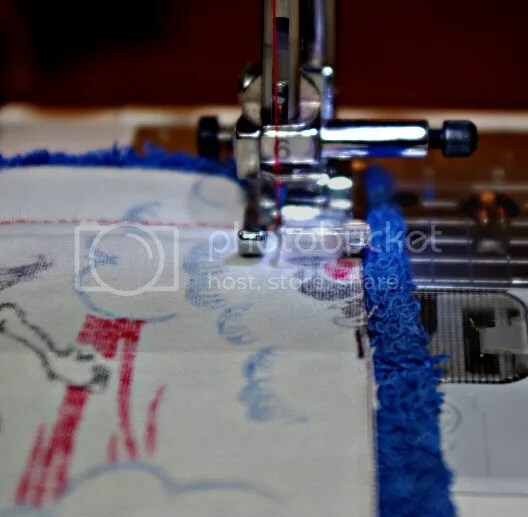 Now, you’ve sewn all the way around and you’re coming back to your original starting point! 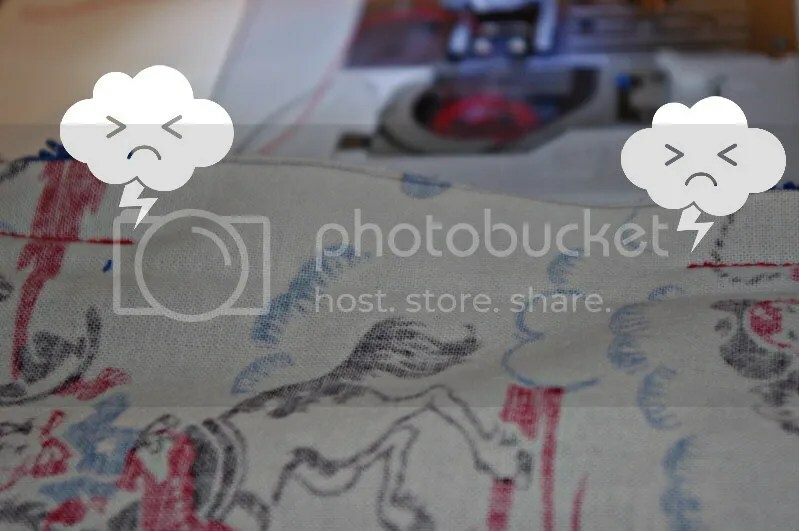 (Which you don’t have to backstitch on, BTW, because we’re sewing over it just a bit.) Oh! Line it up! Quick! Don’t pull too drastically, just guide it so the threads line up! If you’re slightly off, no worries. I doubt anyone will notice. You’ll be a pro by the end of this gift! See, it lined up! Yay! *deep breath* Sew over the line an inch or so. No need to backstitch at the end. You did it! Bravo! Now, do the other burpie the exact same way. And those three wipies. Now those bibs! Okay, now you’ve practiced sewing, turning, and topstitching 5 times. The bibs will be ever so slightly more difficult because they are curved and curves take some patience and practice. Just go slow. Take deep breaths. You can do it. Leave the hole on the straightest part of the bib. I chose the side. 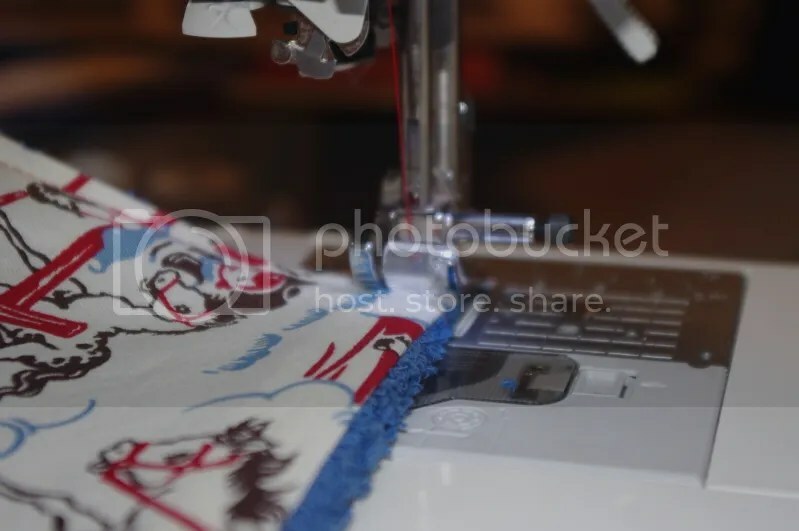 Once you get it sewn, you need to clip the curves (shown in the above picture). Clipping the curves on a bib feels like you’re making fringe our of the entire bib. Try not to clip your seams. (If you do, don’t panic. Just keep rolling. It’ll work out.) Turning this will be much more difficult. You can do it. The straps will turn. Just work ’em. Now that you’re turned, press it. Now topstitch being extra careful. Don’t think you’ll be able to manage? You can zigzag the topstitch to make the ever so small mistakes much less noticeable. Add closure to your bib. I use snaps because I have a snap press. (Not rubbing it in. I do have a snap press.) Don’t use buttons. That is just dangerous. If you don’t have a snap press or snap pliers, use velcro. I had velcro, but it is better than choking a friend’s baby with a button. Don’t use ties. Ties are for bibs from the 80’s. No one has time to tie a bib on a squirming baby. It’ll never get used if you add ties. Now you’re done! Tie it up in ribbons and present it proudly! If you’ve got more time and a contrasting fabric (or more of the same fabric) you can make 2 or 3 or 4 of these sets. These are items every parent needs plenty of. As usual, do what you like with this tutorial. Make these to keep, give, sell, whatever. Just give a shout out back to me and don’t take credit for the work (this tutorial) of others! Free crafting for all!